All are invited to honor those who have served in the United States Armed Forces. The ceremony will feature a welcome from Chief Ana Lalley, a speech from Mayor David Kaptain, as well as several musical selections and representation from local veterans organizations. 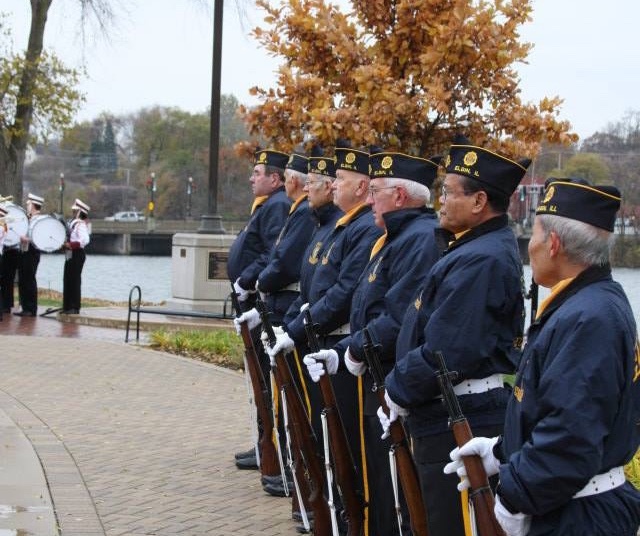 This year's event will also recognize the 100th anniversary of the American Legion. Limited seating will be provided; the public is welcome to bring chairs if desired. Parking is available in the Gail Borden Public Library parking lot. About Elgin: Nestled along the banks of the Fox River, Elgin, Illinois is approximately 38 miles northwest of downtown Chicago and is home to over 112,000 people. The growing city enjoys ready access to public transportation, diverse housing stock and a mix of commercial establishments. Many national and international businesses have taken advantage of Elgin’s close proximity to the Elgin-O’Hare Tollway and to the “Golden Corridor of Technology and Commerce” along Interstate-90. A recent recipient of the Governor’s Hometown Award, Elgin features a nationally acclaimed library system, an array of healthcare options, and educational opportunities for all ages. Residents and visitors enjoy a thriving cultural arts community, world-class parks, historical museums and over 200 places of worship. This vibrant, diverse community is a registered Cities of Service to recognize its volunteer-rich community and history of civic engagement. Copyright © 2018 City of Elgin, All rights reserved. You are receiving this email because you are a member of the media or affiliated with the city of Elgin. Barb Keselica, Special Events & Community Engagement Mgr.